Get a feel of South India as you check into his Kerala-styled houseboat on the backwaters of North Goa. 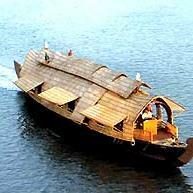 Cruiseing along river Siolim, the accommodation includes two bedrooms and an attached bar. Ideal for families, small groups and Nature lovers, the only drawback is that the residence is seasonal. Bird-watching cruises are available from 7am to 8am. Check-in is at 10am and check-out is at 9pm.